– The Silas Young-Kyle O’Reilly match was a good time for both to face each other as Final Battle looms. 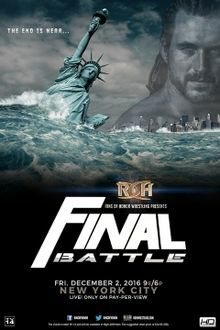 O’Reilly was penciled in as the definite challenger for whomever was ROH World Champion by then, given the winner between ROH World Champion Adam Cole and Jay Lethal. We also appreciated the effort to put Young over as someone in primed position to one day be atop the card, evidenced by how close he came to beating Cole on Sep. 22 for the Title. Sort of a slow bout to start, with basic chain/technical wrestling with a couple of standoffs. Expected in the “feeling out” process. Young got some momentum as he threw O’Reilly aggressively into the barricades. O’Reilly was put over by commentary for his keen predator-esque mindset that focused on the target of different body parts in a match. They traded stiff forearms as Cole came down to join commentary to badmouth Cole as a coward. Young kicked out of a power maneuver, which prompted O’Reilly to lock in his armbar. Young escaped and nearly hit Misery, but ended up in the Brainbuster to lose the match. A fine match with an added emphasis to showcase Young’s toughness (he didn’t tap out) and keep O’Reilly hot. Young’s post-match promo used his great ability to pick on the fans as a device to hype his FB encounter with Jushin “Thunder” Liger. A fan in a Liger outfit made it all possible. That said, we would’ve had a mention of the Young-Liger match much sooner than after this bout. 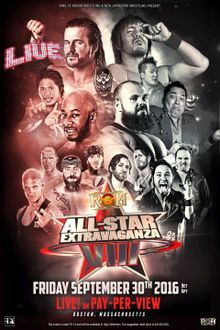 – This episode was best known for Steve Corino’s “return” to color commentary on Ring Of Honor television after a one-year suspension. Yes, the catchphrases are back and they won’t have to sub in “Mr. Wrestling III” anymore. Of course, we have our fears of BJ Whitmer back in the picture, but let’s stay optimistic. – We had two big matches set for this episode and the opening video focused on one of them – a six-man tag between Jay Lethal/Tetsuya Naito/Evil and ROH World Champion Adam Cole/Yujiro Takahashi/Hangman Page. It basically brought us back to the reason for the match last week, as Bullet Club loved the fact that Lethal had no friends and it was Lethal who reminded us of his past alliance with Naito/Evil of Los Ingobernables de Japon as they backed him up on the stage.